A visit to Ca’del Boscaco, one of the crown jewels of Franciacorta, begins at front gates designed by artist Arnaldo Pomodoro. As the gates swing open, it’s clear that no expense has been spared, from the dramatic sculptures on the manicured lawns, to the fine cotton shawls handed out to visitors before they descend to the depths of the state-of-the-art-winery. This in itself isn’t remarkable, as many wineries have luxury elements to them. 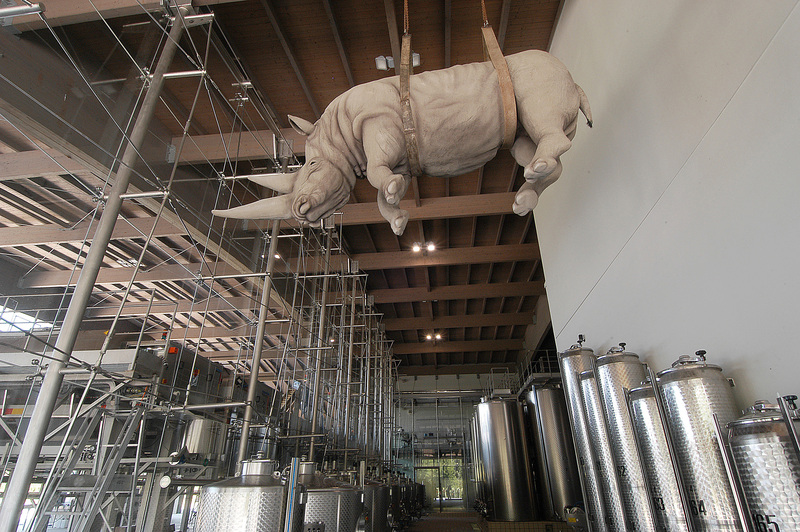 But, it has to be said, very few have a fibreglass rhinoceros hanging above the tanks. ‘Tradition’ is a word used like a mantra in Franciacorta, heard when winemakers are pouring their sparkling wines or winery owners are conducting tours. What makes Franciacorta’s ‘traditions’ so unusual is that they aren’t traditions at all, in the sense of old ways of doing things that have been passed down over generations. Franciacorta’s traditions are a set of mutually agreed-upon rules that came into being within the last 40 years. Although people have made wine in this part of Lombardy for centuries, Franciacorta as a defined region is less than 50 years old and the rules governing its sparkling wine only emerged in the 1980s. Yet within the past decade, Franciacorta has seen its sparkling wines come to prominence in Italy, and has increased production at a startling pace. Some of this is due to the proximity of Milan — it always helps to have a thirsty market on the doorstep — but also because of the approach that the producers of Franciacorta have taken to create a regional identity. At a time when there is intense worldwide debate about the value of ‘regionality’ as a sales tool, Franciacorta offers a model of how to create an effective regional identity from the bottom up – even if there are some kinks still to iron out. The new Spumante quickly sold out. By the late 1970s, a number of wineries were making sparkling wines. There was, as yet, no agreement on how the wines should be made, so while some were Champagne-style metodo classico, others were tank-fermented using the charmat method. What the region’s winemakers quickly discovered it that, no matter how much passion and enthusiasm is applied, the production of quality sparkling wine is difficult. But on the plus side, Franciacorta’s lack of tradition gave them license to experiment. By trial and error, the winemakers and vignerons began to unlock the secrets of their own terroir. Today, the sparkling grapes used in Franciacorta are Chardonnay, Pinot Noir and Pinot Blanc. Ca’del Bosco took sparkling production seriously from the first. Owner Maurizio Zanella had been inspired by a tour of Champagne and went on to hire Moët & Chandon’s winemaker André Dubois. Although Dubois spoke no Italian, he managed to convey some of the essential elements of Champagne’s savoir faire. As it became clear that the future of the region lay in sparkling wines, other producers also hired consultants and oenologists—which has led to claims that Franciacorta’s biggest piece of luck was that its people knew what they didn’t know and brought in outside assistance. By 1983, the DOC region had expanded from 50 ha to 550 ha and, that same year, sales of what was then known as Franciacorta Pinot passed the million bottle mark. The region’s ambitions grew. In 1990, a number of the region’s producers formed the first Consorzio, which laid down strict rules about how sparkling wine should be made in Franciacorta. Only bottle fermentation was to be allowed, they decided, doing away with charmat altogether. As a sign of how serious the producers were, the new consortium commissioned a soil study from the University of Milan, which helped clarify the terroir of the region. By 1995, the consortium had persuaded the Ministry of Agriculture not only to make Franciacorta a DOCG, but also to have phrases like ‘vino spumante’ or ‘metodo classico’ struck from the wine labels. From now on, its sparkling wines would be known to the world only as Franciacorta DOCG. The rules surrounded the production of the wines are, as the producers are quick to tell you, extremely strict. Only Chardonnay, Pinot Bianco and Pinot Noir may be used; maximum yield are ten metric tons per hectare; non-vintage wines must have a minimum of 18 months’ bottle fermentation and so on. Also permitted is a creamier, less vigorously effervescent style of wine made from Chardonnay and Pinot Blanc, called Satèn, a name devised as a substitute for the word Crémant. The Consorzio is now turning its attention to deciding which agencies to deal with and how they should be approached. The end consumer hasn’t been forgotten either. The Strada Franciacorta, or wine road, combines hotels, wineries, spas, restaurants and tourist attractions under one umbrella. To be part of the Strada, wineries must have tasting rooms, while hotels and restaurants must agree to offer Franciacorta wines to guests. Castellini says the founders of the Strada looked carefully at how other wine roads functioned, but also brought their own ideas to bear. In response to growing sales and expanding wine tourism, the region’s producers have been busy building and extending; at Ferghettina, the tasting room was only completed last year. Owner and winemaker Laura Gatti says she is seeing increased visitor numbers, with foreigners in summer and Italians in winter. Barone Pizzini had to build a new winery to accommodate their more than three-fold increase in production; their swish new solar-powered building includes conference rooms for hire. For all that, the Strada is a work in progress. For a start, just dropping in on a winery isn’t encouraged. Some aren’t open on weekends, many charge a tour or tasting fee, nearly all of them require advance bookings — made over the phone, in Italian — and large groups are discouraged. Not only that, but few tasting rooms have spittoons within easy reach. The staff in these establishments pour full glasses of wine, and occasionally seem offended when their visitors spit. Castellini says one reasons that wineries don’t want casual visitors is to discourage the kind of free-for-all drinking that can be seen on the public day at Vinitaly, and also because the wineries don’t have the infrastructure to cope. Wine tourism statistics are not being collected, though visits to the website are tracked. But the goal is that within three years, the entire region will be working together to promote tourism both domestically and internationally. The future holds concerts, treasure hunts and corporate events. As the fame of Franciacorta’s wines has spread, their production has grown at an explosive rate. So far the producers have had no problems selling their wines—90% is sold domestically—but the need to export will become urgent as production levels rise to the 25m to 30m bottles that are possible if or when all 2,283 ha in the region began produce wine. And Franciacorta’s wines aren’t cheap, with an average retail price in Italy of between €10.00 to €35.00, though some of the best can be sold for closer to €100.00. Whether international critics will embrace its wines as readily as the domestic market remain to be seen. But so far, the efforts to create a distinct regional identity have been a textbook case that other regions struggling to articulate their basic proposition could do well to study. The region has done almost everything right, and in an orderly and intelligent way: created and maintained a product subject to strict quality controls; done away with generic terms like ‘metodo classico’; used the best available expertise to identify the best sites; offered marketing help and information to producers; studied the markets; focused its efforts on specific targets; and reached out to consumers through wine tourism. The producers may want to call all this traditional; others might simply call it good business. This article first appeared in Meininger’s Wine Business International. A subscription offer for New Scientist, on the back of a postcard.